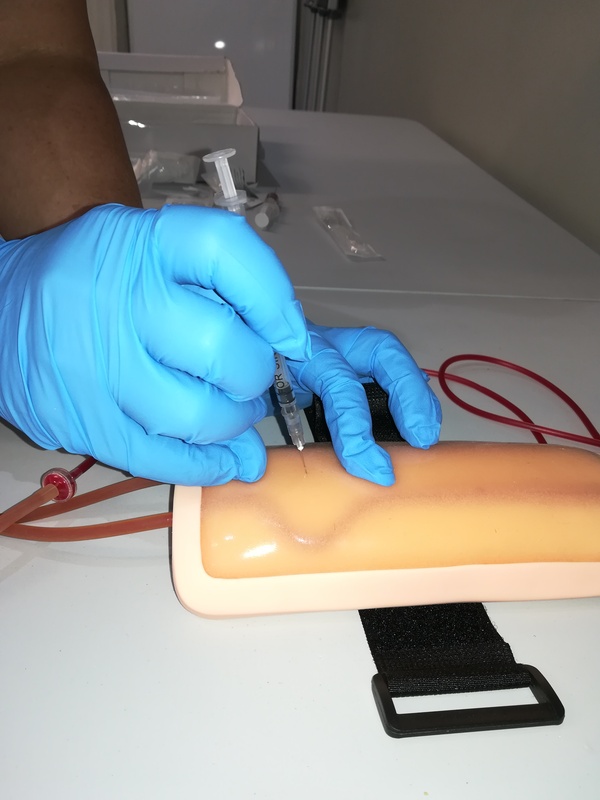 Practice Phlebotomy and Injection Techniques in a Real to Life Simulation way! Latex tubes – DO NOT USE if allergic to latex! 1. Open box and unpack all items. 2. Prepare saline by adding 1 teaspoon of salt to one glass of lukewarm water – stir well. 3. Add red food colorant (optional). 4. Close both roller-clamps on the IV-bag tubes. 5. 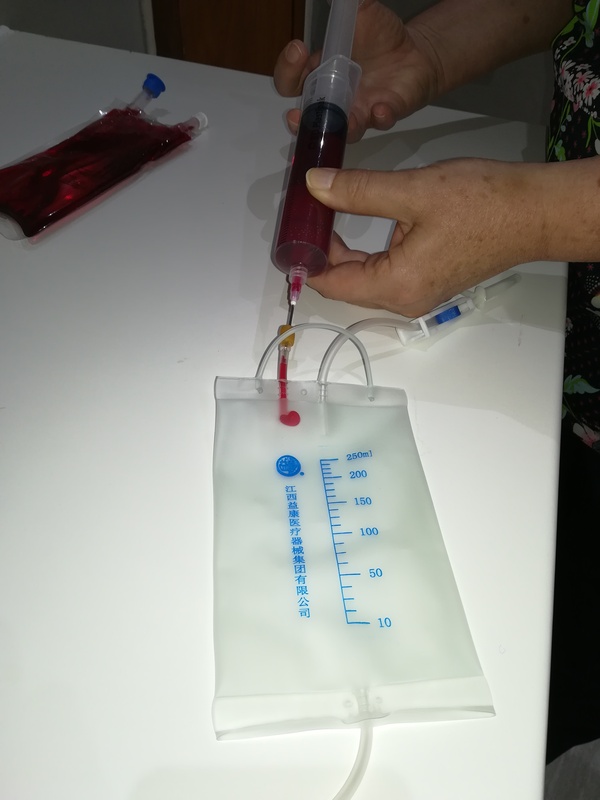 Fill the empty IV-bag by repeatedly – filling the syringe with the prepared saline and injecting it via the ‘in’ port at the top of the IV-bag up to the 200 – 250 ml mark. 6. Hang the IV-bag about 15-25 cm (6-9 inches) above the work surface. 7. Place the outflow (bottom) IV-tube in a container, for receiving any overflow of fluid. 8. Open the outflow (bottom) roller-clamp and press the drip chamber once or twice. 9. Allow the fluid to fill the IV-tube completely – then close the outflow roller-clamp. 10. Connect the IV-tube’s to one of the trainer’s tubes. (First remove the attached scalp needle if supplied). 11. Ensure that both clip-clamps of the trainer are open. 12. Place the outflow (unconnected) side of the trainer into a container for receiving any overflow. 13. Open the outflow roller-clamp and allow the fluid to fill the tubes of the trainer. Once filled close only the outflow clip-clamp of the trainer. 1. Keep the IV-bag inflow roller-clamp (the short tube at the top of the bag) closed at all times. 2. 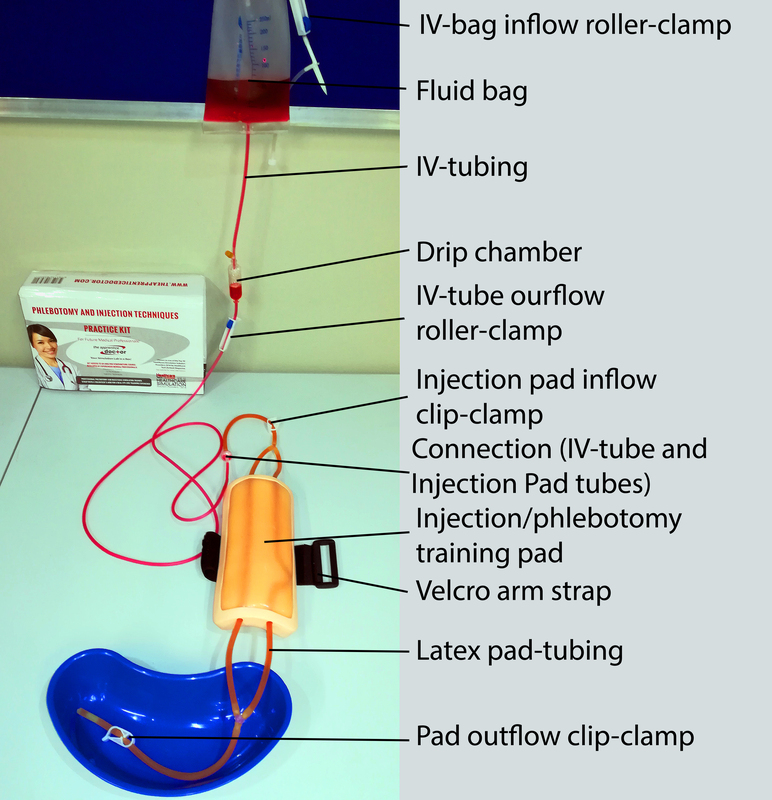 The bag outflow roller-clamp (the one on the long tube to the bottom of the bag) as well as the trainer pad’s inflow clip-clamp must be open during all phlebotomy training procedures. The outflow clip-clamp of the trainer should be closed. 3. The connection between the IV-tube and the pad’s tubing may or may not require the use of a connector (supplied). 4. Some IV-tubing has a filter at the end. If it gets blocked – cut it off with a scissors and reconnect. 5. Strap the trainer pad to a fellow student’s arm for a more realistic experience! Enjoy your phlebotomy and injection pad trainer! Close the roller clamp and move to a basin. Open all clamps and allow the fluid to drain into the basin. Flush the container and tubes with water and allow the drain and dry. Replace the trainer pad and all items into the box. The Apprentice Doctor® Phlebotomy Simulation Trainer will withstand hundreds if not thousands of needle sticks! Spread the needle sticks along the length of both vein-tubes. Do not over-use one specific area. Use smaller diameter rather than bigger diameter needles to practice. A 21G or 22 G needle will be better compared to an 18G needle for instance. Venous pressure is quite low and rarely exceeds 20 mmHg. To mimic this low pressure do not put the reservoir container too high above the Simulation Trainer. As little as three to six inches (8-15 cm) is quite sufficient. This will also minimize the tendency of the tubes leaking. The Latex tubes tend to reseal after a needle stick. After a fair amount of use the trainer will start leaking – initially very slightly so. Allow the Simulation Trainer a disuse period of 2 to 3 weeks before using it again to allow the latex tubes to reseal. After extensive use, the Simulation Trainer will start leaking. The Apprentice Doctor® Phlebotomy Simulation Trainers are favorably priced, thus we recommend replacing the old Simulation Trainer with a new one. Do not discard the old Simulation Trainer – it makes for an amazing tool for students to practice and perfect their suturing skills! 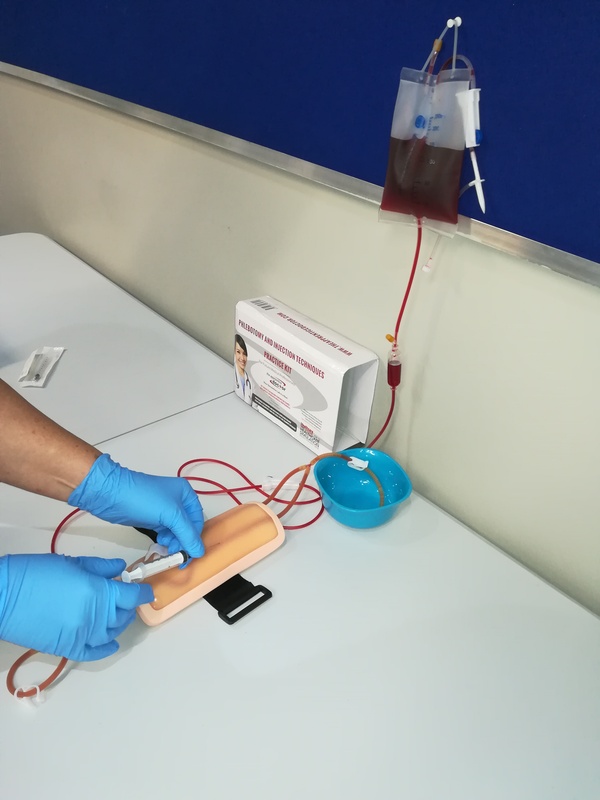 The Apprentice Doctor® Venipuncture Course and Kit compliments the Apprentice Doctor® Phlebotomy Training Pad to perfection! This is a remarkable course in phlebotomy and IV-techniques with lots of items for practicing those skills. Use our super-popular Apprentice Doctor® Anatomical Simulation Arm for your next Phlebotomy Workshop! Visit www.TheApprenticeDoctor.com/shop/ for more information or to order. (Academic and bulk order discounts may apply). 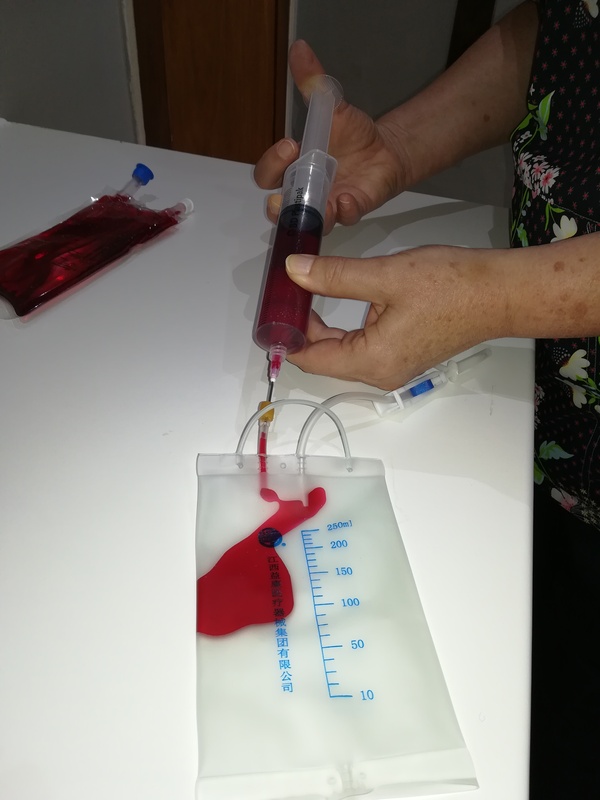 Our Phlebotomy Workshops are fun! The Apprentice Doctor® can come to you and perform a phlebotomy workshop – Enquire Here!